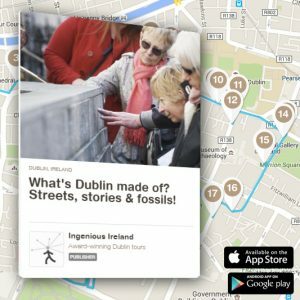 You are here: Home › Buzz › New Dublin walking tour, 500 million years in the making! An unusual new Dublin guided tour is taking people back in time and face-to-face with Jurassic creatures, just by strolling the city streets. Called ‘Dublin Rocks’, the walking tour explores the very fabric of the city’s landscape with a mix of ‘stones, streets and stories’, to the delightful accompaniment of Noel Purcell singing Dublin can be heaven. Highlights include Charles Stewart Parnell’s cobblestones, Mrs Coade’s artificial stone, how Dublin was bricked up in the 1700s, and a little-known gallery of Irish marble on Stephen’s Green. The new tour was launched by Minister for Natural Resources, Conor Lenihan TD, today [Wednesday, August 25, 2010]. Minister Lenihan praised the tour for enhancing “public awareness of the building stones, geology and architecture all around us in Dublin’s city centre”. He added that “as well as being an excellent addition to Dublin’s tourism offering, it is clearly also a valuable new educational tool”. 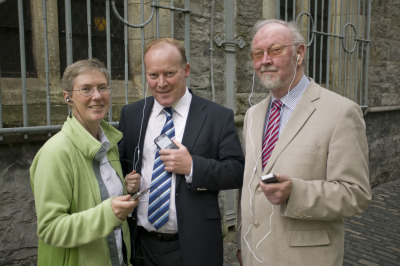 ‘Dublin on the Rocks’ is doubly unusual in that it is an audio guide, or podcast tour: visitors download the commentary to their phone or MP3 player, and then they can take the tour whenever they want – even from the comfort of their own armchair! 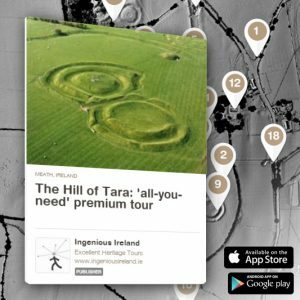 The new project was developed with support from two agencies that promote Ireland’s built heritage: the Geological Survey of Ireland (GSI), and the Heritage Council. GSI supported the new project as part of its work promoting our ‘rocky’ heritage. Dr Pat O’Connor, GSI Deputy Director, described the tour as “a stroll through space and time”. It will, he said, give people “new insight into some of Dublin’s iconic buildings, as well as geology’s fundamental importance in daily life”. The route takes people from Dublin’s mediaeval and cathedral quarter, to Georgian Merrion Square, and ends at St Stephen’s Green. “It takes about 90 to 120 minutes, depending on how long you spend examining the fossils!”, Mary Mulvihill said. The tour was launched with a real walking tour today, led by the author, as part of Heritage Week. People can hear an extract at www.ingeniousireland.ie. The full tour costs just €4.95. Ingenious Ireland gratefully acknowledges the support of the Heritage Council and the Geological Survey of Ireland for this project. Sound production was by Twintrack Media. More about the audio tour: The tour lasts over 90 minutes – longer, if people spend time admiring the fossils. There is an hour of commentary, and 16 stops along the route, including sculpture, iron railings, antique windows, cobblestones, some jewellery, and lots of buildings, old and new. The journey starts at Dublin’s mediaeval quarter with St Audeon’s and the city walls, travelling down Dame Street to Georgian Merrion Square and ends at St Stephen’s Green. 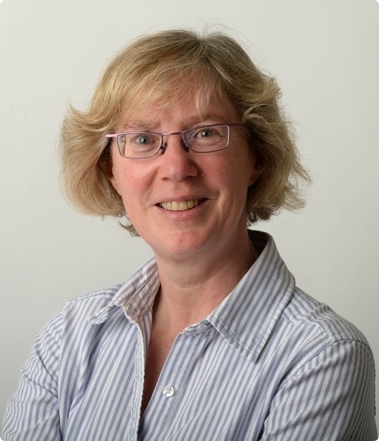 About Mary Mulvihill: a writer and broadcaster with over 20 years’ experience, Mary won a number of awards for Ingenious Ireland, her book on the country’s scientific heritage. 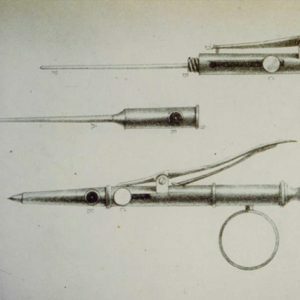 She is now developing a suite of ‘ingenious’ audio tours based on the book, and the next one – ‘Blood and Guts’ – will be a walking tour of Dublin’s medical history. About the Geological Survey of Ireland (GSI): founded in 1845, GSI is Ireland’s Earth science agency, responsible for providing geological advice and information. 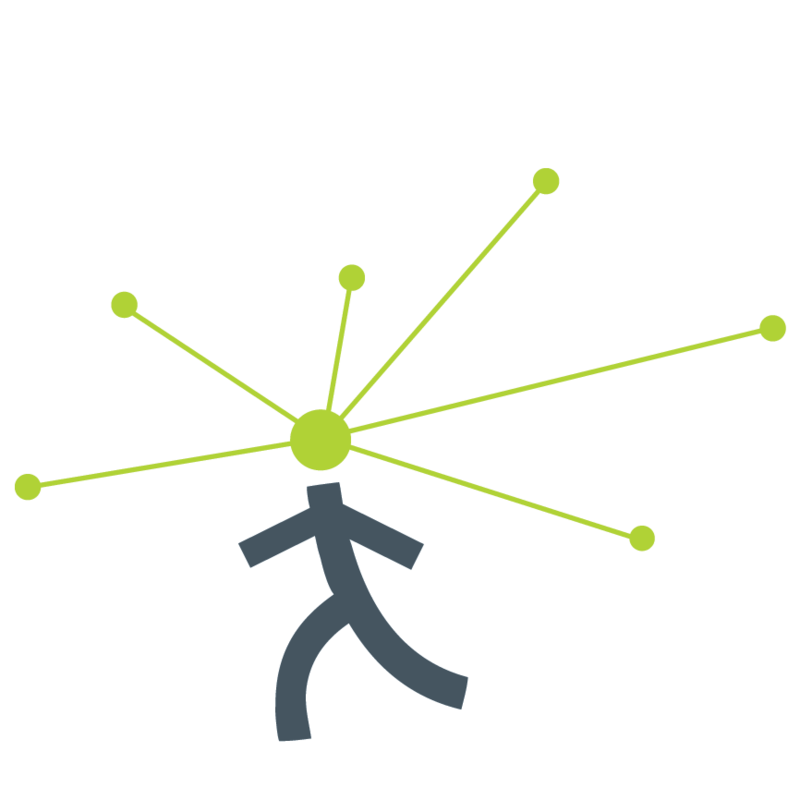 GSI produces a range of products including maps, reports and databases and acts as a knowledge centre and project partner in all aspects of Irish geology. A division of the Department of Communications, Energy & Natural Resources (DCENR) , it has some 40 multi-disciplinary staff. 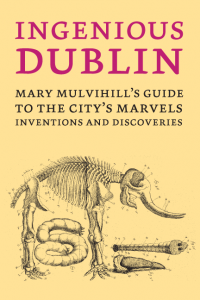 3 Responses to New Dublin walking tour, 500 million years in the making! Dublin is a very beautiful city to visit.